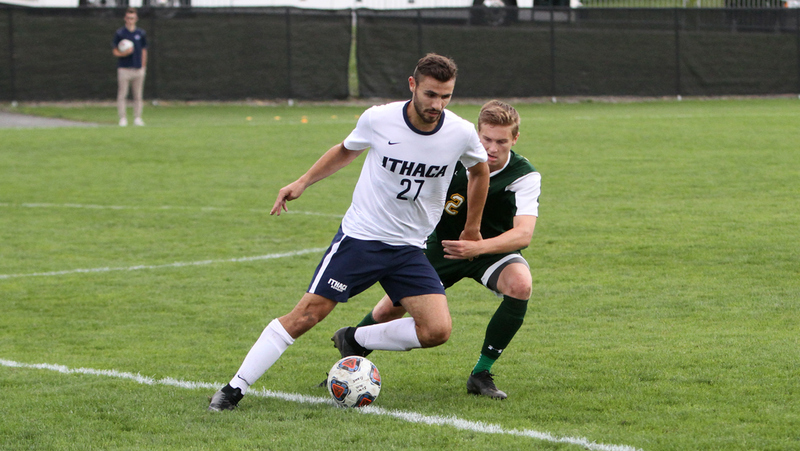 The Ithaca College men’s soccer team defeated Liberty League Conference opponent Bard College 2–0 Oct. 6. After taking their first loss of the season to Hobart College on Oct. 3, the Bombers were looking for redemption and they proved themselves by shutting out the Raptors in the away matchup. The South Hill squad came out strong, with junior midfielder Jack Monnes taking the team’s first shot in the first minute of play. After that, the Bombers’ momentum slowed slightly as Bard earned two corner kicks in the second and fifth minutes, then took their first shot of the game during the eighth. Monnes responded in the 10th minute by notching the Blue and Gold’s first shot on goal which was saved by Bard freshman goalkeeper Logan Leppo. Sophomore Jonathan Kyriakidis had the next opportunity for the Bombers in the 17th minute, but his shot went wide of the net. Bard had chances in the 25th and 28th minutes but neither shot was on frame. In the 30th minute, the Bombers were finally able to finish with freshman midfielder Theo Scott drilling a shot into the back corner of the net from 20 yards out to give the Blue and Gold the lead. Sophomore defender Tom Dillmann tried to capitalize on the momentum with a shot just a minute later but Leppo came up with the save once again. However, this did not slow the South Hill squad, who dominated possession in the following minutes. In the 39th minute, Scott came through for the Blue and Gold again with a low ball to the right corner to put the Bombers up 2–0 and tally his third goal of the year. Another shot by Monnes went high in the 42nd minute and Leppo came up with another save on a Dillmann shot in the 44th to end the half. The South Hill squad outshot the Raptors 6–4 in the first half. Play in the second half was aggressive from the first whistle. Two fouls on Raptors, one on the Bombers, and a yellow card for Bard sophomore forward Alex Meci were all tallied within the first five minutes. The total number of fouls in the second half between both teams was 14. Although both teams took more shots in the second half than the first, neither were able to capitalize on their chances. The second half ended scoreless and the Bombers came away with the victory. The Blue and Gold finished with 22 total shots to Bard’s 11, and freshman goalkeeper Tyler Lewin had to make only three saves, while Leppo ended the day with 10. 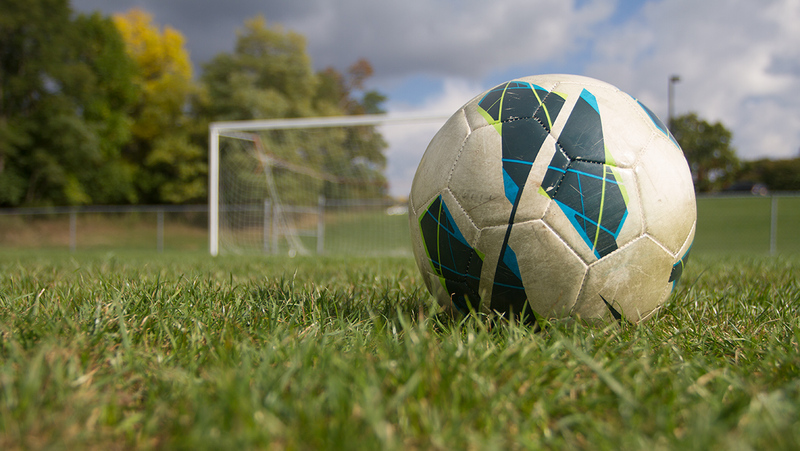 The South Hill squad will be back in action for a non-league competition at 4 p.m. Oct. 9 against Alfred University at Higgins Stadium.